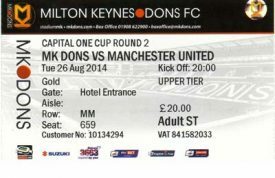 ‘Come on You Dons’ – Some Experiences of a Milton Keynes Dons Fan. It wasn’t until I was researching for this project that I learnt that right from the very beginning of Milton Keynes as a new town, designated in 1967, the Milton Keynes Development Corporation (1967–1992) saw a stadium capable of accommodating a top-flight football team as part of the plan. However, there was a considerable wait for the fruition of this plan, with what would become Stadium MK first being proposed in 2000 by the Milton Keynes Stadium Consortium or “Stadium MK”, led by Pete Winkelman and his company Inter MK Group. Included in this proposal for a large development in the southern Milton Keynes district of Denbigh North, was a 30,000-capacity football stadium. This plan was not helped by the fact that there was no professional football club in Milton Keynes with the highest ranked team, Milton Keynes City playing in the Spartan South Midlands League. To help justify the development plan the developers proposed to bring an established league club to Milton Keynes. After much deliberation with a number of clubs the team to move was Wimbledon FC, thus starting the rivalry that continues between the two clubs today. June 2004 brought about the changing of names, badges and colours with the new name for the team being Milton Keynes Dons F.C. who played at a temporary home namely the National Hockey Stadium while the development of the new ground continued in Denbigh. Ground was broken on the stadium in February 2005. 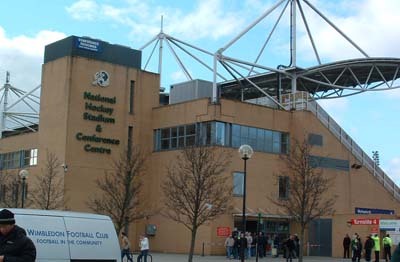 In December 2005 MK Dons set a target of playing at the new ground by January 2007. However, the proposal was revised in February 2007 to build a 22,000-seater stadium to be ready in July of that year. The new ground StadiumMK hosted its first match in July 2007 with Her Majesty the Queen officially opening it on 29th November 2007. I moved to Milton Keynes with my husband and new daughter (aged 2 weeks) in November 1972 as part of the Milton Keynes Development Corporations’ drive to bring families to the ‘New Town’. For the previous 6 months my husband had been living in lodgings in Bletchley whilst working in the area and I had been back at home with my parents awaiting the arrival of our baby. The delay in our planned move had been brought about by the builders strike and the fact that I didn’t want to change midwives and hospitals so near to the birth. We lived in the designated area of Milton Keynes for the next 9 years before moving to Deanshanger in March 1981 but still retained the MK postcode. In 2007 my husband and I decided it would be good for us ‘follow’ a local Milton Keynes team. The plan was to try out supporting a few teams and then decide. I must admit I was hoping for something that was played in the summer in the better weather or worst case scenario indoors. As I thought he would my husband suggested going to watch The Dons. So it was that I found myself sitting in the North West corner of StadiumMK on a cold December Saturday. I know I shouldn’t say it but I don’t remember much about that first game except that despite my ‘I’m not really sure I’m going to like this’ demeanour I came away hooked!!! As soon as we parked the car I got caught up in the atmosphere around me. There seemed to be a great many people and all appeared friendly despite the mixing of the two fan groups. From the outside I was quite impressed with the stadium and I was thankful that the Dons were not still playing at the National Hockey Stadium when we came up with this plan. I bought my programme (at least I would be able to read this if I got bored) and we went to find our seats. There was plenty of leg room and I could see over the man in the seat in front of me. Good Start. All I needed now was a cup of tea and I would be quite happy. We were quite near the away fans and the noise was loud but I was soon caught up with the cheering and shouting that was going on. The referee was admonished quite a few times by various people including me for not having gone to ‘Specsavers’. The singing and chanting was quite infectious and it became over the coming years a good way to de-stress. 5 goals were scored at ‘my end’ and the Dons came away victorious. The game ended far too quickly, ‘programme what programme?’ and I wanted to find out when the next home game was. We went to all the remaining home games of the season sitting in East Premium. For the next season we became season ticket holders in East Premium moving the following year to Club Red and finally to Club Gold where we have been for the past 5 years. This area offers us the ability to arrive early for the game have something to eat, meet a player and catch up with other supporters in our own room before taking our seats on the balcony above the West Stand. The balcony also accommodates the VIP’s attending the games and I have seen many famous faces here including Sir Bobby Charlton; Sir Trevor Brooking; Sir Alex Ferguson; John Motson; Ray Lewington and many more. 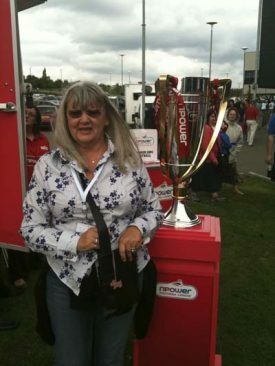 During these intervening years I have missed very few home fixtures and when I have my place has been taken by family members or friends. Our current season ticket allows us to attend any pre-season friendlies that are organised and any cup runs that we may be involved in. It was because of a cup run that I was sitting in the stadium one Tuesday evening in late August 2014 to watch the next round match. There had been quite a lot of hype about this game with special t-shirts being printed and sold in the club shop. I had bought one for my grandson and he was wearing it with pride. It was of course the game against Manchester United. Our little band of Club Gold supporters had been talking about this game for weeks and now the moment had arrived. I hoped ‘the boys’ would do well and I dearly wanted them to score a goal. I was looking forward to the game along with 26,968 other fans (the biggest ever crowd at the time to watch the Dons). The noise of the crowd was tremendous until the 25th minute when the Dons scored. At that point you could have heard a pin drop in the stadium. No-one could believe what was happening. It wasn’t until the scoreboard showed MK Dons 1 – 0 Manchester United that the stadium erupted with cheers. Then followed lots of flashes as the scoreboard was photographed for posterity and as evidence that we weren’t dreaming. I was happy now ‘the boys’ had scored and even more so as they had done it first. Half time arrived with the same score line – unbelievable. It was great to be a Dons fan. No matter what happened in the next 45 minutes no-one could take this away from us. What did happen was that MK Dons went on to score 3 more goals in the 63rd, 70th and 84th minutes. We had done it 4 – 0, what a night. New t-shirts appeared with the addition of the score printed on the back. My grandson wore his new shirt too. The only other bigger crowd attended the cup game with Chelsea 28,127 watched as MK Dons lost 1 – 5. I was there for that game which demonstrated the ups and downs of football so well. Another game that I should mention in this section is the one that resulted in MK Dons being promoted to the Championship. It was the last game of the 2014/2015 season and I thought it would be just another league game. I was as always sad that the season was ending and wondering what I would do with my Saturdays for the next few weeks. By now at each game I was listening to the BBC 3CR radio commentary of the games and this keeps the listener up to date with all the results of other matches. The Dons were in a playoff position at the start and I was looking forward to perhaps a visit to Wembley. However, that was not to be. By half time hopes were being raised as the team in second place Preston were losing whereas the Dons were ahead. During the second half it became evident that I was not the only person listening to the radio, there was an excited buzz around the stadium especially in the Cowshed and even in the dugout and directors box. The players on the pitch picked up on the excitement and against all odds continued to play well for the remainder of the game. At the final whistle it began to sink in that ‘we’ were going into the Championship. There was a friendly invasion of the pitch by numerous supporters and then the presentation to the players. Whilst sitting watching these great scenes I was hoping that our foray into the Championship would not mean that things would change. I enjoyed the relaxed atmosphere in the stadium and the freedom of access to the players by various means on match days, along with visits and good works in the local community by the squad members and staff. The Dons presence and involvement in the community can be seen by the work of its Sports and Education Trust. People I worked with became members of the various disability teams that the Dons support and each year they were invited to a Presentation evening to celebrate the achievements of all teams and individuals. During their involvement with these teams I watched these individuals grow in confidence and skills with these celebration events becoming the highlight of their year. On occasions I have been present for the presentations and I was very proud to be involved as a supporter of an organisation who could work with these individuals in this way. Come on you Dons! 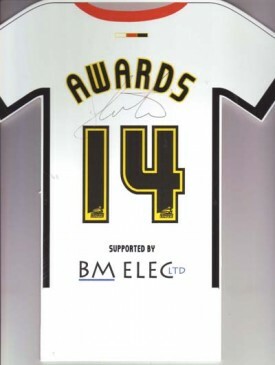 I have also attended several of the Player of the Year awards which offer another opportunity to meet the players and even get an autograph or two (Samir Carruthers on a cardboard copy of his shirt) and perhaps a photograph. 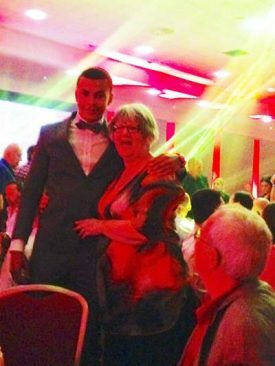 My pride and joy of these occasions must surely be the photo of me and Dele Alli the year he was voted Young Player of the Year and had in the previous January been signed by Tottenham Hotspur. Over the years I have frequented the Club Shop mainly to buy my grandson, Maxwell, a new kit. It’s usually the goalkeeper’s jersey etc. as he plays as a goalie in his various teams. I had of course bought myself a scarf and the team mascot toys quite soon after becoming a season ticket holder. Donny and Mooie have become a permanent fixture on the dashboard of my car much to the amusement of my family. During the 2014/2015 season I noticed the shop had a new offering of a garden gnome wearing the white home kit. My purchase was made and stored in the car whilst I watched the game. My brother-in-law who lives in Northern Ireland had become a long distance supporter of the Dons which meant that we would have weekly bursts of text about the current game. I decided before the game had finished that I would buy him a gnome as a Christmas present. Little did I know what I had started. Having got my gnome home I was aware that he had no-one to kick his ball to and consequently the next home game I bought another one. Now I had two I had to think of names, no competition really they became ‘Lewie’ and ‘Georgie’, my boys. For the Non-Don aficionado, I thought I had better make them easier to tell apart. Hair and beard were painted along with team numbers on shorts etc. and they settled into their new home. Several weeks later I received a text accompanied by a photograph of Mickey Don (my brother in law’s gnome) sitting in the greenhouse looking out over the garden. A week later another arrived with Mickey Don now sitting in a newly dug flower bed. I could not get left behind so giving him much cause for excitement Lewie accompanied me on my holiday including becoming a stowaway on board the ferry, watching for otters whilst sitting in a hide and watching for birds from the car dashboard. All these antics of course were photographed and sent to Northern Ireland. So the saga continues and I await the next instalment. I have already mentioned another of my boys, Maxwell and he has come with us to watch a few games and will be joining us for the 2016/2017 pre-season friendly against Everton when he stays with us in the next few weeks. 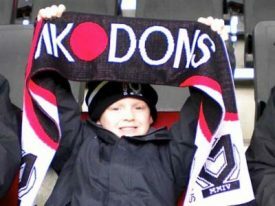 So hopefully he will become the next generation of Dons supporter. It will soon be the start of yet another season but my visits to StadiumMK have become much more than supporting a Milton Keynes team. They are a time for meeting like-minded people, giving and receiving light hearted banter, putting the world to rights and if we’re lucky and its someone’s birthday eating cream cake. Hopefully after our relegation at the end of last season it will not be long before the Dons return to the Championship but in the meantime I will continue to enjoy all the season has to offer. Come on you Dons!! !